Jenn of Indie Fixx is a genius and a savior! 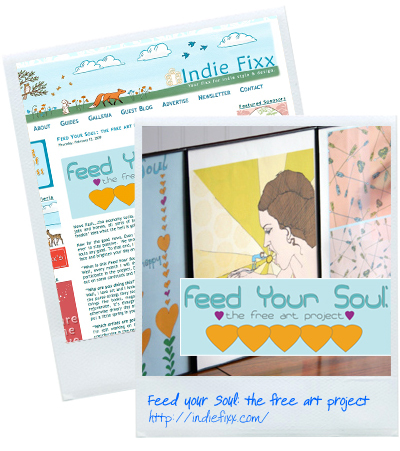 Meet "Feed Your Soul"... free art! I swear. Current contributing artists: Samantha Hahn, Jessica Gonacha and Jenn herself!! OMG.....how aweseome is that?! wow. thanks so much for posting about this! isn't it exciting? yay! thank you so much for posting. i'm so excited that berkley illustration is going to be participating! love their stuff.